In other news, scientists, tourists and startled gondoliers have reported a sighting of the famed Grand Canal Monster, popularly known as "Grandie." Unlike the Loch Ness Monster, which is usually seen as a long neck with a little head on the end of it, the Grand Canal Monster appears as two gigantic white human arms and hands. In the past, Grandie has been mistaken for some large, submerged ancient Roman statue, but that idea was debunked when it was seen by two people who were selling knockoff Gucci handbags to let go of a building it was grabbing and sink back into the water. In addition, Venice was not an ancient Roman city, so no statues were built there by the Romans. Other people built statues there later, but not the Romans, because they weren't there to do it. The appearance of the monster has caused great concern within the ranks of the Venetian municipality. They are wondering if the creature will wreck some kind of havoc on the annual Regatta and on the gondola business. Tourists, on the other hand, are heading to Venice in huge droves and bringing their iPhone cameras with them. Several people have been accidentally pushed into the polluted water, causing them to get very angry. Venetian police are putting in a lot of overtime trying to control the crowds of people, most of whom can't even speak Italian. We'll have more on this later. Right now, let's go to Jim James for the latest sports news. This was written in response to a photo writing prompt by author Jody Townsley Morse, posted on Facebook on February 3, 2018. **The image is of the sculpture "Support," by the artist Lorenzo Quinn. It set up in the water of the Grand Canal to call attention to the problem of Global Warming, which is causing sea levels to rise. Thanks! It's too bad you missed this prompt. It was one of the fun ones! 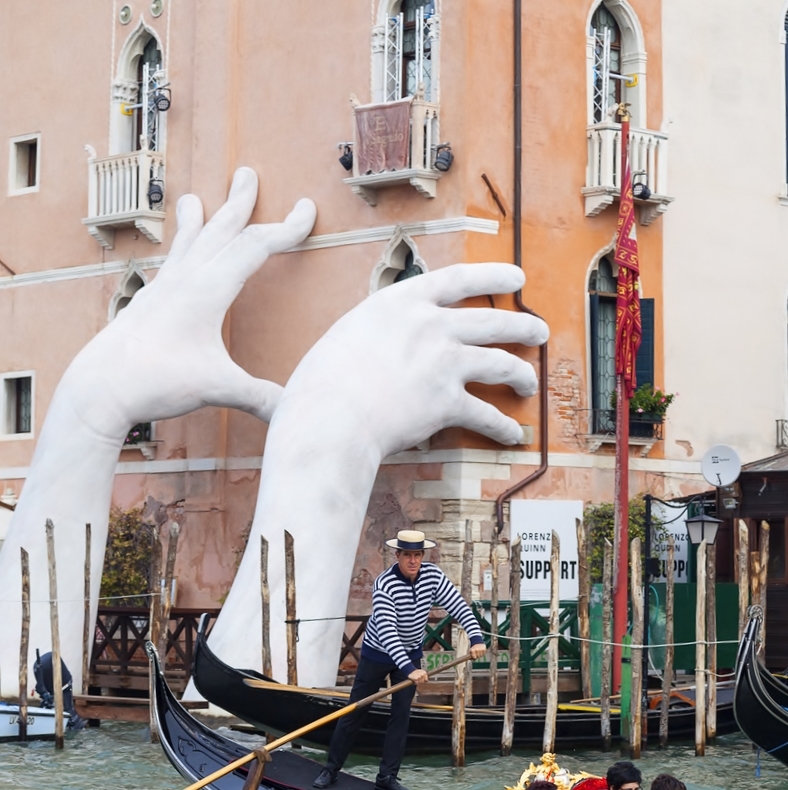 The artist who made the sculpture wanted to make people pay attention to rising sea levels, which are especially apparent in the city of Venice. This was his way of warning against man-made climate change. When I saw the photo prompt, I think I immediately thought of a sea monster. I have a strange imagination sometimes.